Avocados…strawberries…lemons…blueberries…raspberries…fruits I’ve never seen before and can’t name. On any given day of the week, I walk past people selling these things before I ever get to a grocery store or mercado. They sell their wares from wheelbarrows, woven baskets, car trunks and the beds of pickup trucks, huge plastic pickle buckets, and on blankets spread on the sidewalk. The main streets of Cotacachi, Ecuador, are like a daily, informal farmers’ market. FDA approved? Nope. Certified organic? Nope. Pesticide free? Who knows? The long arm of regulatory law doesn’t extend very far into the fields and patches and groves of the locals. The only thing you can say for sure is that whatever is on offer recently came out of the ground, off the tree, or off the vine from someplace nearby, probably picked or plucked by the same person selling it or a member of their immediate family or community. Someone recently started an informal “organic” market day once a week here in town that features products that the vendors say are 100% organic. We believe them. 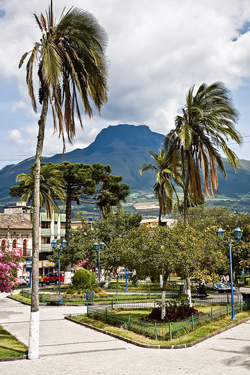 At an elevation of 8,000 feet, Cotacachi experiences a year-round spring-like climate—perfect for expats who dislike extreme hot or cold weather. Of course, the formal farmers’ market, the mercado, goes on every day as well, near the end of our main street, next to the bus station. This one is a bit more like the trendy farmers’ markets in the U.S. with organized booths and such. But the prices are a little different. We usually just ask for 50 cents or a dollar’s worth of whatever we’re after and see what we get. We get a lot. The offerings in the mercado can come from farther away than the local farms. We get pineapples and bananas from down by the coast, cabbages and peppers and potatoes from farther up the mountain, apples and grapes from Chile. But much of it still comes in from the local countryside, especially on Sunday, the main market day, when the outside annex of the mercado is covered in bags and baskets and bundles and heaps of dozens of varieties of beans, corn, onions, squash, peas, potatoes, and other produce. Again, if you need a stamp of hygienic approval, a listing of nutritional value, or a 100% organic certification from some government agency, you’re out of luck. They offer the goods, you ask about it, they tell you, you haggle a bit, and you either buy it or you don’t. It’s a market. That’s how they work here. I’m fine with that. If I want something that’s been produced, processed, inspected, and packaged under uniform conditions at prices that aren’t negotiable, I have a small, modern supermarket in town as well. 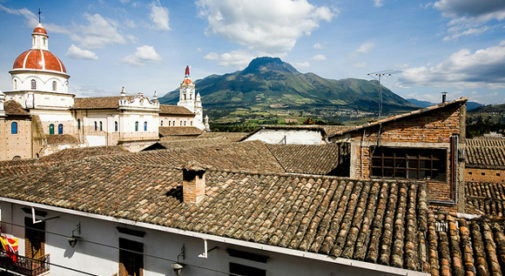 Modern-day life has its advantages, and we have most all of those advantages in our little Ecuadorian village. It’s the best of both worlds as far as I’m concerned. I can head up to the mercado for fresh fruits and vegetables, stop at the Tia Supermercado for crackers, olives, and cheese, and grab a pint of blueberries or a dozen mandarinas from a street vendor on the way home. Best of both worlds? Best of all worlds.